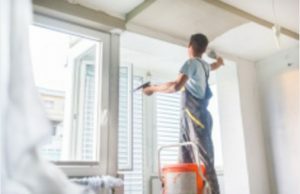 When painting in Providence RI now and then people like to take stock of their homes and plan painting projects to give the house a fresh appearance. Although painting may seem like easy work, to do it right requires several careful steps, a practiced eye, and a steady arm. While some homeowners feel comfortable using a roller to paint the walls, they often realize that it’s better to call a pro in Rhode Island for the more challenging painting projects. Homes with elegant trim that is a different color than the walls or that has an ornate design can be very difficult to paint evenly. However, professional interior painters in Providence have experience and the proper tools to carefully and accurately paint hard-to-reach or delicately-sculpted trim inside the home. Indoor or outdoor pillars, room dividers, and similar features can be painted just the way you want them with the help of expert painters.